The Metlakatla Development Corporation is pleased to announce the launch of its new website at metlakatladevelopment.com. The new site includes information on the Metlakatla Development Corporation's governance, history, wholly-owned businesses, current partnerships and latest news. The online link for the annual Metlakatla Member Census is now online. Members 15 and over and living in the traditional territory are encouraged to complete the Census at their convenience between now and August 26, with everyone completing a census form entered to win a number of prizes. The Metlakatla First Nation Land Code outlines how Metlakatla will exercise its authority to govern, manage, and administer those reserve lands and resources. This document provides a “plain English” version of the Metlakatla Land Code. The left column has the proposed text of the Land Code and the right column has what the text means in simplified terms. If the Land Code text is self-explanatory, the right hand column was left intentionally blank. Metlakatla Fisheries would like to designate one or two fisherman to participate in a potential economic demonstration fishery that will follow the next Area 4 commercial gillnet salmon fishery. Candidates must have their Fisher's Registration Card (FRC) in order to participate, the vessel can be a commercial or non-commercial FV. The vessel must be equipped with a revival box for non-allocated species. The Metlakatla Lands Department is having a Video Contest. We are asking Metlakatla Members to record yourselves, telling us what you feel are the benefits of having a Land Code, or if you are supporting the Metlakatla Land Code. These are just a couple of examples, we want to see your creativity and positivity! Winners will be chosen at random and announced on Monday, October 3, 2016. Metlakatla residents are invited to a free lunch on July 25 from 11 a.m. to 2 p.m. for a community business forum presented by ThriveNorth in partnership with Futurpreneur Canada and Prince Rupert LNG. Please note that, as per the most recent Notice of Election and the Metlakatla Election Code, electronic voting will not be included in the August 19 Chief and Council election. If you are not able to attend a polling station, please ensure you complete and mail your ballot to Electoral Officer Lawrence Lewis. Mail-in ballots not received by the Electoral Officer before the end of voting hours (8 p.m. on August 19), 2016, will not be opened, recorded or counted. Due to slow returns, Metlakatla Fisheries (MFP) will be distributing sockeye at the rate of 10 sockeye per member, and maximum of 40 per household, until abundance allows for distribution of the full allocation. MFP staff would like to remind fishers that the program is responsible for distribution, and there are still elders and members without fishing capacity that need to receive sockeye before moving onto other band members. The Metlakatla Fisheries Department is undertaking food fish distribution and asks all members to please be patient and respectful of Metlakatla Fisheries staff. We will attempt to reach out to each member on the contact list, but are working to address the food fish needs of elders, members traveling from out-of-town and members without the ability to harvest their own food fish first. 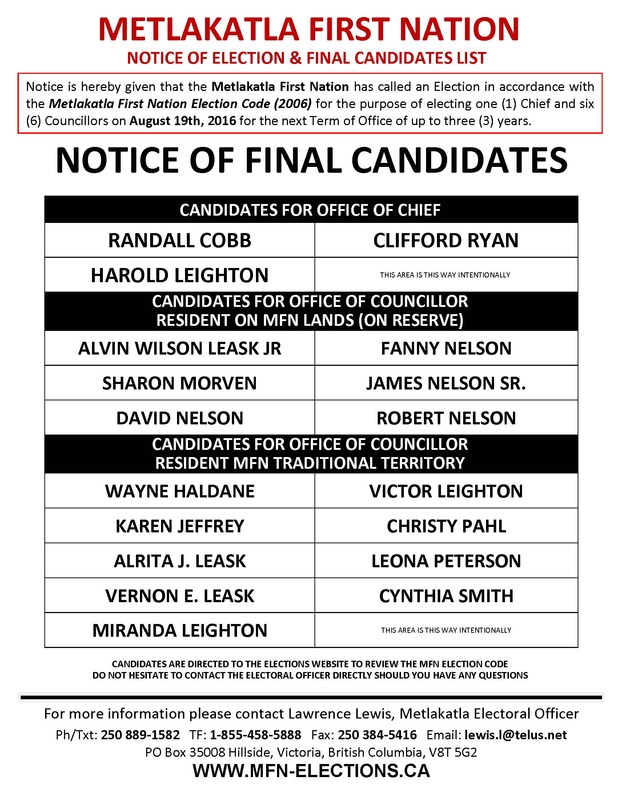 Click here to view the final list of candidates in the Metlakatla Election, scheduled for August 19, 2016.